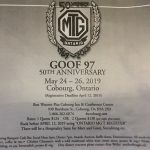 The North American MGA Register has declared Saturday May 4, 2019 to be "Drive Your MGA Day". We call it "Drive Your MG-eh! Day" and ALL club members are invited to join in, regardless of the model of MG they drive!! The Boot'n'Bonnet All British Car Club is holding their annual AUTOJUMBLE on Sunday, May 5, 2019. Click here to view the Boot'n'Bonnet Autojumble event flyer.